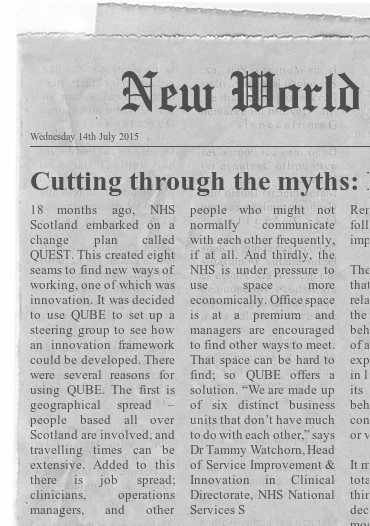 18 months ago, NHS National Services Scotland embarked on a change plan called QuEST. This created eight core objectives for new ways of working, one of which was innovation. 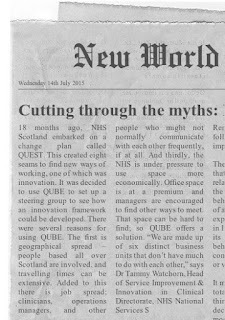 It was decided to use QUBE to set up a steering group to see how an innovation framework could be developed. There were several reasons for using QUBE. The first is geographical spread – people based all over Scotland are involved, and travelling times can be extensive. Added to this there is job spread; clinicians, operations managers, and other people who might not normally communicate with each other frequently, if at all. And thirdly, the NHS is under pressure to use space more economically. Office space is at a premium and managers are encouraged to find other ways to meet. That space can be hard to find; so QUBE offers a solution. Generally, there are two key challenges that can inhibit take-up; one is cultural, and one is technological. The cultural issue is that it can be hard to explain QUBE unless you try it out for yourself; and there can be resistance from people if they think it’s merely a sophisticated version of conference calling. “Once people have tried it, however,” Dr Watchorn says, “they quickly convert. I don’t think there’s been anyone who really hasn’t bought into it.” Technologically, the NHS is a huge organisation with different directorates, and some were more positive about allowing the new technology past the firewalls than others. What should we do about the credit crunch?